As the first men’s volleyball playoff game of the season commences, the relatively big crowd does not shy away to show their support to either the Santa Monica College Corsairs or Pierce College’s Brahma Bulls. The first set starts with #14 Bernardo Roese of Pierce College spiking in the first point. Points are continuously being made by both sides when Pierce College calls their second timeout with the scoreboard at 22 to 24 (favoring SMC as they have the set-point). SMC ends the first set by winning at a score of 25 to 23. During the majority of the second set, SMC lead by a few points. Pierce then comes back and the two teams are back in forth spiking points with the scoreboard showing the teams only a point or two away from each other. Pierce ends up winning this set with a score of 25 to 21. Pierce college is up a few points during the beginning of the third set until the Corsair’s catch up and the score is tied at 6 to 6. Pierce calls a timeout with the score at 9 to 12. The Corsairs continue on making point after point, to which then Pierce calls another timeout with the scoreboard at 11 to 17. The Corsairs continue with a winning score a few points ahead of Pierce, and even call a timeout with the scoreboard at 24 to 20. Max Petuhov (#15) of Pierce sets the ball to which AJ Peyrot (#20) of SMC spikes the ball and ends up making the winning point of the third set. The fourth set commences with Pierce College’s Brahma Bulls giving it their all as they make four points in a row with the Corsairs having made none. The Corsairs seem to be losing steam, as Pierce is up by 6 points, to which SMC calls their first timeout of this set. The timeout seems to not have hyped up the Corsairs enough as they lost the fourth set with the scoreboard at 21 to 25. The rarely seen fifth set starts and the crowd is growing louder and louder by the minute. The Corsairs take the first point and the crowd cheers with excitement. Pierce calls a timeout with the score tied at 10 to 10. 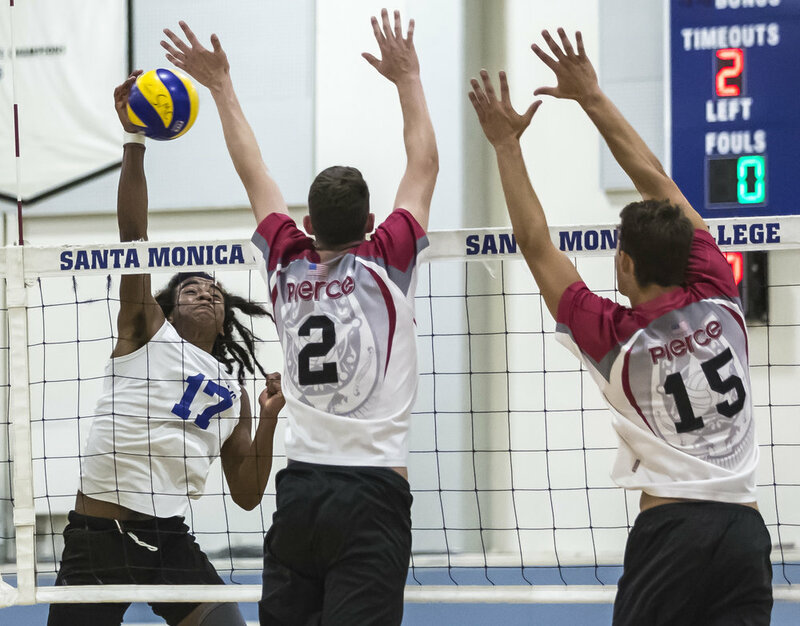 Andrew Dalmada (#5) of SMC breaks the tie by spiking in a point. The scores tie again at 13 to 13, which the Corsairs break again, and have the set-point. The crowd is filled with cheers and screams from fans of both teams, as the next point or two determine which team takes home the win and a chance at the playoffs. Fans of both teams scream out cheers of support as Pierce gets ready to set. Jadrien Louden-Wiser (#5) of Pierce spikes the ball which goes out of bounds and the Corsairs get the winning point. The roaring crowd screams with excitement as the Santa Monica College Corsairs finish the game as winners. What allowed the Corsairs to stand through five sets and come out as winners? 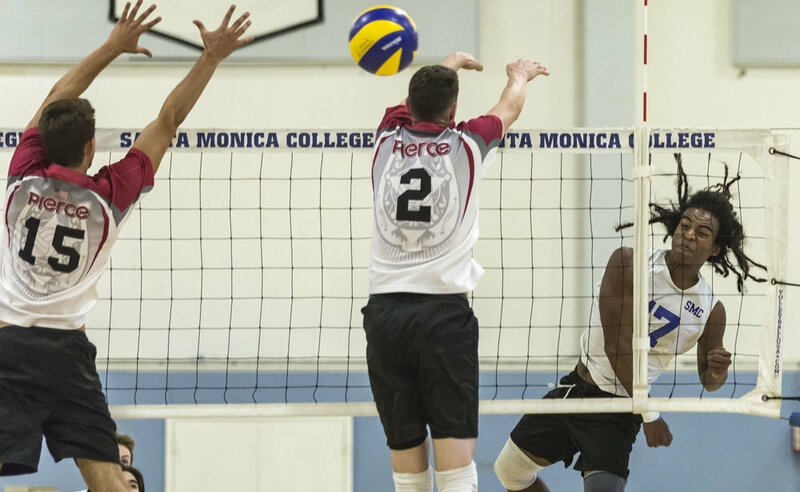 “We don’t really have one superstar, we don’t have one best player it could be any guy on any night and I think that plays into the strength of we rely on everybody even the guys that don’t see the court,” says the Corsair’s men’s volleyball coach Jackson Metichecchia. “We hung in there, Pierce played a really good game. I’m just really happy the guys were in control and stayed in the moment, I think it’s tough to do and they showed some toughness today”. 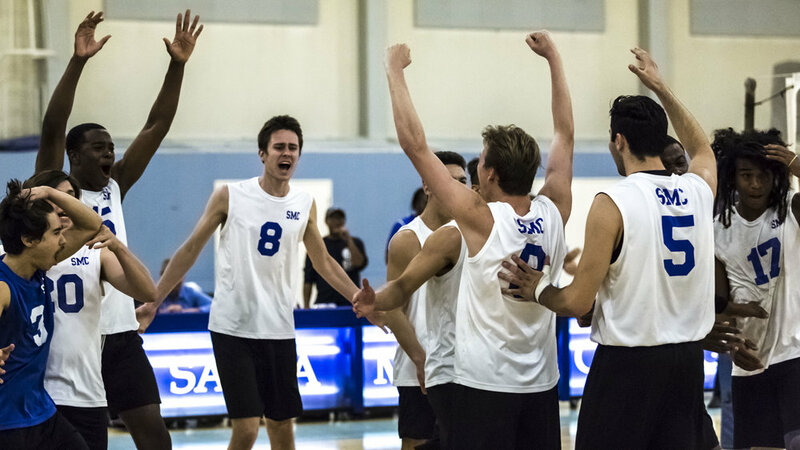 The Santa Monica College Corsairs are now set to play in the semi-finals at Pierce College this Thursday, April 27, 2017.